Enneagram styles operate as nine personality paradigms or world views. These paradigms become the organizing assumptions and core beliefs that influence and determine our perceptions, thoughts, feelings, and behaviors. They are at the core of how we think and feel about our selves, about other people, and about the kinds of interactions we can imagine and allow ourselves to have with others. That is to say, they are at the heart of our interpersonal style. Our mind likes and looks for regularities. Paradigms or schemas are based on and formed around the recurring patterns we notice. They help us make sense of our experiences and provide us with a predictive capacity to anticipate what’s going to happen next and what affect our behavior will have on our surroundings. Our paradigms or schemas can be based on an objective appraisal of naturally occurring events in the world (adaptive schemas/divine ideas) or they can be based on a faulty construction of those events (maladaptive schemas/fixations). We fashion representational patterns of our experiences in our mind and act on these appraisals, assuming they are accurate. Having some structure or basis of interpretation is preferable to having none at all. Functioning with no paradigms leads to confusion, anxiety, inaction or random action. Employing inaccurate paradigms at least leads to ersatz certainty and predictable action. Though we may always see everything the same, and though we may only be going around in circles, at least we know what we’re going to see and where we’re going to end up! Barker observes that paradigms establish and define boundaries and inform us how to operate inside those boundaries in order to be successful. They provide us with rules for playing the game. We are experts as long as we can play the game by the rules of our paradigm. If we are given a new set of rules from another paradigm or if others won’t play according to our norms, we are back to ground zero and usually become angry, bewildered, confused and easily manipulated. An example Barker uses is the extraordinary memory and brilliant play of chess masters. When an opponent is moving their chess pieces according to the rules of the game, chess masters can remember the position of the pieces with amazing accuracy because they know where the pieces should be moved. However when they are up against a computer moving the pieces in a random manner, the masters’ memory of the placement of the pieces is no better than anyone else’s. So our personality paradigms make us masters in our own domain. Within the boundaries of our interpersonal style we are confident, comfortable, and relatively secure. People can’t compete with us on our own turf. We’ve worked the territory for years and our moves have become automatic. But if we’re taken into another’s domain, into their paradigm, we’re at their mercy. That’s why our interpersonal strategies and moves are designed to get others to play our game. When they won’t play our way, we get frustrated, confused, and won’t play any more. The insights of transactional analysis into the Games People Play (1964) are illuminating in this context. How do these paradigm proficiencies show up in Enneagram styles? ONES are masters at being correct and right and doing what they should do. If you want to know how to do something well, ask a ONE. Or if you want a good critique or good quality control, consult a ONE. In the game of ONE upmanship, ONES will come out right. On the other hand ONES may feel at a loss if you ask them to come out and play with you. Or if principles and guilt don’t matter to you, the ONE won’t know how to deal with you or motivate you. TWOS are masters at sensing people’s needs and accommodating themselves to meet those needs. If you want to learn how to empathize, how to help people and make them feel comfortable, ask a TWO. In the game of TWO upmanship, TWOS will come up more helpful. On the other hand if you don’t need them, TWOS may not know how to relate to you. If you want to deal with them as an equal, they might become fearful. Or if you love them before they can do anything for you, they will become confused. THREES are masters at getting things done, accomplishing tasks, and looking good. If you want to know how to organize reality and how to do things efficiently, consult a THREE. If you want to know how to sell yourself or your product or how to create the right image to be successful, ask a THREE. They’re often in the consulting business doing this, anyway. In the game of THREE upmanship, THREES will come out looking successful. However if you don’t have any goals for them to achieve or if you don’t have anything for them to do for you, they may become dissatisfied and leave. Or if you want to relate to them personally on an emotional level and aren’t particularly impressed by, or interested in, their posturing or their achievements, they may not know how to be with you. FOURS are masters of drama. They thrive in deep emotional waters where there are intense feelings and frequent squalls. They like intensity and stimulation and excitement to make them special. If you want to learn how to feel deeply and live life passionately, seek out a FOUR. If you want to appreciate and value suffering or if you want to attune yourself to the sufferings of others, ask a FOUR how to do it. In the game of FOUR upmanship, FOURS come out more sensitive or more hurt. On the other hand if you relate to them in a detached intellectual manner, they may be out of their element, like a fish out of water. Or if you don’t think they’re particularly special, they’ll either try to make an impression on you so you’ll remember them or they’ll drop you and move on to a more discerning audience. FIVES are master thinkers and observers. Their element is the world of clear and distinct ideas. They are at home in their head and feel secure and confident there. If you want to get the whole picture, if you want to synthesize what you know, or if you want to reduce what you know to its essence, consult a FIVE. If you want to know how to detach from your feelings or from your situation, ask a FIVE how to disassociate. In the game of FIVE upmanship, FIVES come out appearing wise. However if you aren’t especially enamored of ideas but believe feelings or actions are where it’s at, or if you try to get FIVES out of their heads and into their feelings and bodies, then you may lead the FIVES into a state of inarticulate confusion. SIXES are master worriers and loyalists. They live in a world of fear and intrigue. There are dangers all around that they are scanning for. They are especially sensitive to authority figures and the potential threat they may bring. If you want to find out what responsibility, loyalty and carrying out obligations is all about, ask a SIX. If you want to learn how to ferret out danger in your environment, observe a SIX. Or if you want to know how to discover whether an authority is trustworthy, ask a SIX what to look for. In the game of SIX upmanship, SIXES come out loyal. On the other hand if you are a person exercising some authority over them or if you are not similarly alarmed by, or against, the enemies they perceive around them, they may translate you into the enemy camp. SEVENS are master players, entertainers, story-tellers, adventurers, visionaries, bon vivants. If you want to know how to generate options — more than you could ever pursue — consult a SEVEN. If you want to learn how to enjoy life, how to find something good in everything, how to appreciate reality, ask a SEVEN. In the game of SEVEN upmanship, SEVENS come out smiling. However if you believe in hard work or aren’t amused and delighted by their tales and adventures, you may find yourself considered a bore and left earthbound below by a soaring SEVEN. Limited decisions and repetitious tasks are not in the SEVENS ‘ rule book. EIGHTS are power masters. They know how to get power, how to use it, how to keep it, and how to prevent others from having power over them. They understand the art of the deal and how to bring enough pressure to bear to get what they want. If you want to know something about power, how to confront a challenge, how to get things off your chest, how to sense phoniness, ask an EIGHT. In the game of EIGHT upmanship, EIGHTS come out on top. But if you engage an EIGHT on the level of love, peace, and tenderness you might be met with a resisting finger or fist in your face. They can be confused by altruism and grace. NINES are masters at negotiation, compromise, and resolving or avoiding conflict. They understand how to bring about harmony, how to reconcile opposing views, how to stay in the middle and blend into both sides, building a bridge over troubled waters. If you want to learn how to relax, how to let things go, how to go with the flow and not worry or make a big deal out of anything, consult a NINE. In the game of NINE upmanship, NINES come out settled. On the other hand if you confront a NINE or try to push them into taking a position or taking action before they’re ready to, you may find a stubborn opponent. Also if you pay too much attention to them and inquire too forcefully into their needs and wants, they may not know how to respond to you. If you substitute paradigm for construct, each personality paradigm may be maximally useful for handling certain matters. In other words each personality paradigm has a focus of convenience. This focus of convenience is the marrow, the sweet spot, where the construct works best. It encompasses those aspects of reality that are most in focus; that arena the paradigm is most clear and explicit in elucidating; that part of the territory that falls within the beam of the spotlight. Surrounding areas might also be illuminated by the spotlight, but they won’t appear as sharp and highlighted. Areas more distant and remote from the focus will remain vague and shadowy or may not be seen at all. Other spotlights or paradigms may be needed to cast light on them. Each of the types in the Enneagram spectrum has an intuitive sense about certain realities. Helen Palmer (1988) highlights these nine intuitive openings and shows how they can lead to subtler aspects of higher consciousness. The clarity or clairvoyance provided by paradigms is another way of interpreting this phenomenon. 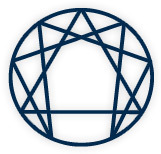 From the Enneagram perspective, the nine personality paradigms search out and illumine particular aspects of reality or certain domains of the territory that are deemed important to them. We see some things more clearly than others, understand some things better than others, problem-solve certain issues more easily than others, are more competent in some areas than others are. And this is not necessarily because we are more intelligent, but because our spotlight enables us to see, grasp, and deal with certain realities more clearly and facilely. So it’s not that we’re mystically intuitive (though this may also be the case), we’ve just been looking for and looking at the same things most of our time. We see things before others do because we’ve spent our whole lives scanning for certain data. When we enter a room, because our paradigm is telling us what is important, what to look for, and where to look for it, we may see things that other people with different paradigms simply don’t see because they’re looking in another direction or looking for something else. While we’re looking at the floor, they may be looking at the ceiling. We’re experts at carpets and they’re expert at chandeliers! ONES notice flaws, imperfections, what’s wrong, when they enter a room. ONES will give you the right word as you’re fumbling to say something. TWOS will sense who is hurting and who needs what. They may know what you need even before you do. At the moment you realize you are thirsty, a TWO is handing you a drink of water. THREES pick up how others expect them to be. They intuitively sense what role to play or how to look and act when they enter a room. They can also tell you how to efficiently write that paper you’ve been mulling over for months. FOURS pick up rejection, disapproval, being abandoned before anyone else senses this. They will also be attuned to the aesthetics of the room and the feeling tone of the group gathered in the room. They are sensitive to any suffering in the room. If there is any hidden feeling or communication between you and them, FOURS will intuit it. FIVES will sense any expectations and demands put on them or any subtle intrusions or invasions of their space more readily and sensitively than others will. As you are about to ask for volunteers for your project, you will become aware that the FIVES have left the room. SIXES will sense any danger lurking in the room. They are scanning for and can detect potentially threatening people or objects. If you bring a hidden agenda, SIXES will be alert to it. EIGHTS will sense who has power in the room, those they may have to deal with as competitors for taking over the room. If they sense a vacuum of power, authority, or protection in the room, they immediately move to take control so they feel safe. As you are about to take charge, you may find yourself being relegated to the back of the room by an EIGHT. NINES can merge with people in the room and sense what it is like to be inside the skin of the other person. They can become the other person. This gives them an intuitive grasp of others’ needs, wants, thoughts, etc. They can also sense harmony, when things are fitting together, as well as disharmony, where there is conflict. But as the level of conflict in the room rises, the level of NINES’ awareness drops, all the way to the point of falling sleep. So our paradigms provide us with a characteristic intuitive acuity of perception. At the same time, they give us a set of problem solving capabilities and skills that allow us to deal with certain situations and events quite well. We’re adept at manipulating particular realities because we’ve practiced doing so all our life. ONES are facile in manipulating ideals, procedures, rules, codes of ethics, and responsibilities. They are good at convergent thinking. TWOS are adept at handling other’s needs and feelings and adjusting themselves to minister to others’ needs. THREES are facile in juggling tasks, establishing priorities, setting goals, and implementing strategies. FOURS have a trained aesthetic eye for patterns and coordinates. They are practiced in manipulating their own fantasies and feelings. FIVES are facile in manipulating ideas, concepts, and categories. SIXES handle catastrophes and emergencies surprisingly well because they’ve been preparing for them every day of their lives. SEVENS manipulate plans, options, and alternatives. They are good at divergent thinking. EIGHTS manage power easily. They are practiced in gaining the upper hand. NINES handle conflict deftly by avoiding it, smoothing it over, reconciling opposites, and harmonizing dissonance. We are especially acute, sensitive, and intuitive about those events that fall within the focus of convenience of our paradigm. Situations that do not fall within our focus of convenience are less clearly understood and less adroitly dealt with. Our personal paradigms work best within their range of convenience. We’re good at some things and clumsy in others. We’re clear headed and hearted about some issues and fuzzy and ambivalent about others. When we make contact with data and events that aren’t handled well by our paradigm, we may need to shift to another paradigm or style that is organized in such a way as to more effectively deal with the situation. Viewing the world from the paradigms of our stress and core points, our neighboring points, or any other Enneagram point gives us an expanded perspective on the world and provides access to the cognitive, emotional, and behavioral strategies of other complementary ways of being in the world. Barker, Joel. (1992). Future Edge. New York: Wm Morrow & Co.
Berne, Eric. (1964). Games People Play. New York: Grove Press. Kelly, George. (1963). A Theory of Personality. New York: W.W. Norton & Co.
Palmer, Helen. (1988). The Enneagram. San Francisco: Harper & Row. The material in this article is from Jerry Wagner’s book in process on Nine Personality Paradigms: the Enneagram Perspective.